Now that you’ve purchased a new home in Summit County, you can look forward to the next chapter in your life. That’s very exciting and I wish you the best. But before you look too far ahead, you should think about packing up the place you’re leaving behind. I understand all the stress involved in moving to another home. So in this blog, I have some important tips to keep in mind as you begin getting organized for the big move. It’s natural to be overwhelmed at the prospect of packing up all of your belongings. There’s just so much to do. But you don’t need to feel paralyzed either. To remain calm during this tense time, start figuring out what you want to take with you and what you might sell, donate or throw out. Systematically go from room to room and make a list of the things you really don’t need. Give yourself some time to dispose of whatever items you aren’t taking with you so that you have less to pack up for moving day. If you have stuff to sell, make sure to put these items in a location that’s easy to access, especially if you plan to have a yard or garage sale before you move away. 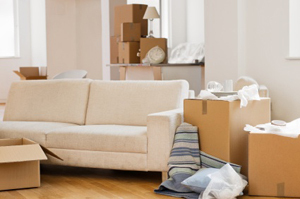 As soon as you’ve gone through your stuff and determined what’s coming to your new home and what isn’t, you might consider setting aside some floor space for each category. This will keep you organized as you begin sorting through your possessions. Moving requires a bunch of different supplies in order to be efficient. So make sure you’ve got plenty of boxes, tape, wrapping papers, stickers for labeling purposes and markers. Once you dive into the packing process, the last thing you want is to run out of materials. That’s why planning ahead is so essential. You can do this in part by estimating how many boxes you will need and the various sizes that are ideal for your things. Also, a good rule of thumb is to use smaller boxes for heavier items and larger boxes for lighter things. That way, the boxes will be easier to carry and transport. Your back will thank you, too. The strain of packing can feel like a huge weight on your shoulders. So you might want to put together a packing plan. If you lay out a schedule, giving yourself a sufficient amount of time for each room, the process won’t be as difficult. Figure having a whole room packed every 2 to 3 days to keep your stress level down. By creating a packing strategy, you’ll feel more in control of the chaos around you. Packing and moving can be messy. So after the boxes are loaded up and you don’t have any other possessions lying around, this is the time to clean. You should make sure to give yourself enough time to scrub down each room so that the whole house sparkles. Don’t leave a dirty place behind for the next owners to handle. Think of this as your gift for the person or family who plans to make your old place their new home. There’s no getting around the fact that moving is stressful. But you don’t have to feel alone as you go through this anxious experience. I’m here to help you with moving tips and tricks that can make everything go as smoothly as possible. Consider me a resource. I’d love to be of service to you in any way I can. I’m also available to help you buy or sell a home in Summit County. Whatever your real estate needs happen to be now or in the future, I’m ready to be your guide. Feel free to contact me at your convenience. You can send me an email at [email protected] or call my office lines. I look forward to meeting you!